PUBLIC RELATIONS WRITING: FORM AND STYLE, International Edition combines the practical approach of a trade book with the fundamental principles and theories of Public Relations to provide you with the essential techniques and methods needed to write with understanding and purpose This text guides you through a logical progression of PR writing, starting with an explanation of how this kind of writing is unique and by exploring the legal and ethical obligations. It will also introduce you to the different styles and techniques behind writing principles that you'll need to develop. 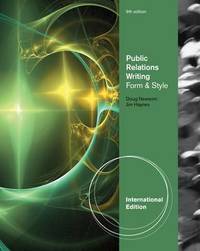 The Ninth Edition features a "writing for select publics" section that covers Public Relations writing assignments that you'll likely come across early in your career: emails, memos, letters, reports and proposals, backgrounders and position papers. Writing for mass media and the more complex public relations writing functions, including media kits, media pitches, print and online newsletters, brochures, magazines, including those online, and annual reports are also covered in this comprehensive guide. The new edition features a separate exercise book that contains 3 PR Scenarios and a Quick-Study for each chapter.